Greenhous, Brereton. 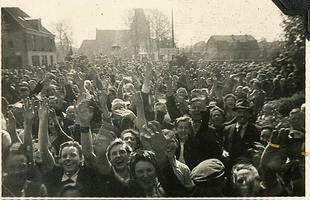 "Liberation of the Netherlands". The Canadian Encyclopedia, 28 August 2017, Historica Canada. 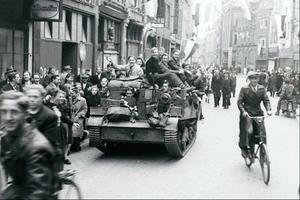 https://www.thecanadianencyclopedia.ca/en/article/liberation-of-holland. Accessed 21 April 2019. In the final months of the Second World War, Canadian forces were given the important and deadly task of liberating the Netherlands from Nazi occupation. In the final months of the Second World War, Canadian forces were given the important and deadly task of liberating the Netherlands from Nazi occupation. From September 1944 to April 1945, the First Canadian Army fought German forces on the Scheldt estuary — opening the port of Antwerp for Allied use — and then cleared northern and western Netherlands of Germans, allowing food and other relief to reach millions of desperate people. 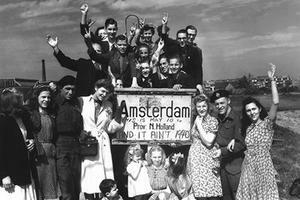 Today, Canada is fondly remembered by the Dutch for ending their oppression under the Nazis. British and American troops first entered the southern Netherlands in early September, 1944, three months after the D-Day landings in Normandy. In mid-September, the Allies launched Operation Market Garden, a massive airborne assault on the Dutch town of Arnhem, hoping this would allow them a quick route into Germany, via a crossing of the Rhine River at Arnhem. The Arnhem attack failed, slowing the Allied advance and keeping most of the Netherlands under German control. As the Allies sought another way into Germany, they needed a large harbour through which to ship supplies to their advancing armies. The Belgian city of Antwerp, one of Europe's biggest ports, had already been liberated, but the 70-kilometre long estuary of the Scheldt River, which connected Antwerp to the sea, was still held by the Germans. The task of clearing the estuary of enemy forces was assigned to the First Canadian Army. The First Canadian Army was Canada's principal fighting arm in northwest Europe during the war. A powerful strike force under the command of Canadian General Harry Crerar, it included the 2nd Canadian Corps, as well as large contingents of British, Polish, American and Dutch infantry and armoured troops. Since the Battle of Normandy in the summer of 1944, the Army had formed the left flank of the Allied advance towards Germany — with the First Canadians liberating ports and cities along the Channel Coast of France and Belgium. Upon reaching the Netherlands, the First Canadian Army was ordered to clear the banks of the wide, multi-channelled Scheldt River between the North Sea the port of Antwerp. It was a treacherous landscape for attacking troops to operate in — flat, soggy, sometimes-flooded land, situated below sea level and enclosed by a series of dykes. Under the leadership of Canadian Lieutenant-General Guy Simonds (who had temporarily replaced Crerar), Canadian and British soldiers fought a series of fierce battles through October and early November, including amphibious assaults from small boats against German defences along the estuary. Aside from the use of boats, the movement of men, tanks and other equipment was often restricted to narrow roadways along the top of dykes, under frequent German fire. The First Canadian Army lost nearly 13,000 men killed, wounded or missing during the Scheldt fighting, including more than 6,300 Canadians. However, by 8 November the estuary and its large islands had been secured. The river was then cleared of mines, and on 28 November the first convoy of Allied cargo ships entered the port of Antwerp. The First Canadian Army spent the winter patrolling its portion of the front line in the Netherlands and France — skirmishing occasionally with the enemy — while American forces in Belgium fought back against Germany's surprise attack in the Ardennes Forest. In February 1945, the Allied advance in northwest Europe resumed, with a huge offensive to drive the enemy across the Rhine River. It fell to the First Canadian Army to clear the area between the Maas and Rhine Rivers, pushing German forces eastward over the Rhine. In March the First Canadian Army was reinforced by various Allied units, including the 1st Canadian Corps, and transferred north from the battlegrounds of Italy. For the first time in history, two Canadian army corps were fighting together. And with an international strength now of more than 450,000 men, the First Canadians became the largest army ever commanded by a Canadian officer. In late March, as other Allied armies crossed the Rhine into Germany, the First Canadian Army began rooting out German forces in the remainder of the Netherlands. The Canadians faced stiff fighting in places, and were also hampered by the broken roads, bridges and other infrastructure destroyed by the fleeing Germans, who blew up some of the dykes in the western Netherlands, flooding parts of the countryside. The Canadians were greeted as heroes as they liberated small towns and major cities, including Amsterdam, Rotterdam and The Hague. Millions of Dutch had suffered terribly during the harsh "hunger winter" of 1945, and Canadian troops facilitated the arrival of food, fuel and other aid supplies to a population in the midst of starvation. General Charles Foulkes, commander of the 1st Canadian Corps, accepted the surrender of German forces in the Netherlands on 5 May. Two days later, Germany formally surrendered and the war in Europe came to an end. More than 7,600 Canadian soldiers, sailors and airmen died fighting in the Netherlands. They are buried today in official war cemeteries across the country. The largest, Groesbeek Canadian War Cemetery near the city of Nijmegen, holds the graves of more than 2,300 Canadians. Canadians are fondly remembered by the Dutch as both liberators and saviors who rescued millions from sickness and starvation in 1945. The joyous "Canadian summer" that followed forged deep and long-lasting bonds of friendship between the two countries. Every year since the war, the Netherlands has sent thousands of tulips to Ottawa, in appreciation for Canada's sacrifice and for providing safe harbour to the Dutch royal family, which lived in exile in Canada during the war. The Canadian-Dutch bond is also celebrated every summer during the Nijmegen Marches — an annual, international military marching competition — at which the Netherlands' liberation by Canadian soldiers is warmly and gratefully remembered.